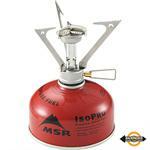 This link, Fuel Mixtures, provides a very detailed account on the various fuel mixtures used in camping stove fuel canisters, the differences of fuels being used and how they are fed to the stove, via upright stoves (MSR Pocket Rocket) or liquid fed stoves (think MSR WhisperLite). The main point being that lower temperatures effect how one portion of the mixture, i.e. the propane, burns off faster then the butane. The article also discusses how maintaining the warmth, (not too hot, that is explosively dangerous) of the fuel canister, will increase the performance of fuel being transferred to the stove. « Big Agnes Fly Creek UL 2 Tent, Winner, 2010 Editor’s Choice Award!